Hair loss affects at least 50 % of men and about 25% of women by the age of 50. 40% of women aged 70 and over are concerned. Women experience diffuse hair loss and tend to lose the hair on the top of their head. 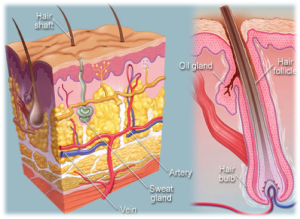 Hair loss in men may be much more extensive, affecting mostly the temporal areas and the top of the head. Many long-term clinical research programs at laser institutes internationally have shown that bio-stimulation of ‘cold-beam’, low-level laser gives numerous positive effects to the skin and hair. The Laser bathes your hair root with a nourishing light measured at a wavelength of 632.8 nanometers and is designed to energize your hair. Light is energy. Living cells “like” light and your hair is no different. The most common example of light converting into chemical energy is photosynthesis, where plants are fed via light converted into chemical energy. Scientific studies on cell cultures have shown that laser penetrates into soft tissue and increases the action of adenosine triphosphate (ATP), a molecule that is a major carrier of energy from one reaction site to another in all living cells. Since the late 1700s, scientific studies have shown that sunlight- or the lack of it- definitely affects our body’s biochemistry. Light also affects our hair, including how fast it grows. We have all experienced how our hair grows quicker during the summer, and this increased growth is due to improved blood supply to the hair follicles stimulated by the red light in sunlight. Recent Clinical Trials by a hair laser company suggests that more than 90% of users achieve some positive benefits and results. “In general, about 45% of users see noticeable indications of benefits from use of the laser within the first 6 weeks,” according to Dr. Martin Unger, the company’s Medical Director “Another 45% realize indications from 6 to 12 weeks and 5% see subtle improvements after 12 weeks. A: Laser treatments are good for the hair. It works in varying degrees on everyone, from slowing, arresting or reversing hair loss to increasing the shine, body and elasticity of hair. Nothing is more detrimental to your personal appearance than thin-looking lifeless hair. Laser is recommended for either men or women who are in the early stages of hair loss or who demonstrate sufficient hair follicles capable of being rehabilitated by the laser hair therapy program. To maintain a healthy head of hair, especially if there is a history of baldness in your family, the sooner you start, the better. Usually noticeable improvement is achieved in 4 to 6 months. However, if you have heavy hair fall-out, you may notice a reduced rate of fall-out after only a few treatments. Results vary per individual, and compliance is necessary to achieve the best results. Unlike many treatments, the laser’s energy works on all areas of the scalp: front, top, back, and sides. A: To appreciate how it works, you need to understand the basics of how hair grows and replaces itself in its natural cycle. Every hair on one’s head usually grows for several years and then falls out. The root then rests for some weeks before starting to re-grow a new hair. This cycle continues throughout our lives. Unfortunately, as we age, some people replace fewer hairs than are shed (and/or thinner, lighter hair) resulting in thinner hair and gradually baldness occurs. You don’t go bald or thin out because your hair falls out – it’s meant to do so. You go bald or thin out if it doesn’t grow back! Laser used on a regular basis strengthens and regenerates the hair roots. This slows or arrests, and in some cases, reverses the degenerative cycle as previously described. Once the hair roots are dead, nothing can be done to restore them, so the sooner treatment is started, the better your results are. 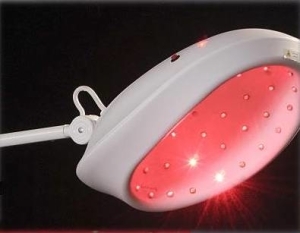 Therapeutic pure red light stimulates blood supply to the hair bulb and scalp, increasing the number of red blood cells that deliver vital oxygen and nutrients. The result is a restorative and repairative chain reaction that clears debris from the hair shafts, swells the cortex and closes the cuticle leading to a healthier scalp and hair that looks and feels softer, thicker and shinier, and is more easily managed. Used in conjunction with hair restoration products and nutrient therapy, laser light therapy delivers even more benefits, because the laser light closes the cuticle. When the laser is used with quality conditioners, damaged hair, split ends, and even dry, matted hair begin to show improvement. Even the negative effects of chemical perms are reversed with laser treatments, because each strand of hair is nourished and repaired; making perms look more natural and waves and curls last longer. This is because the laser not only bonds the conditioner to the hair, leaving each strand repaired and shining, it also bonds moisture, invaluable for repairing damaged hair. Laser light uses the scientific principle of photo bio-therapy. This process occurs when cells absorb light and repair themselves. Laser light penetrates deep into the tissues of the scalp, stimulating micro-circulation of blood supply, cell metabolism and protein synthesizes. Clinical studies suggest that this cellular and sub-cellular activity breaks down the collection of DHT helping to stop hair loss. * Energization –Transforming laser energy into cellular energy. Laser light increases the energy available to cells so they take in nutrients faster and get rid of waste products. Not surprisingly many, scientists and physicians have been using low level laser over the past 30 years to speed wound healing and produce new tissue. “ If we start from a normal quantity of hair bulbs per square cm of the various subjects involved, we can state that there was strengthening of hair bulbs…hair growth could be actually ascertained – also its being darker than before”. * Vibration – Bringing cells into harmonious oscillation patterns. The soft tissue and fluids in our bodies actually vibrate! They do this within a frequency range similar to that of cold-beam, red-light laser. When its vibrations become irregular or out-of-step, it can be brought back into “synchronization” by being irradiated with low level laser working at quantum level. A: Yes! Laser Light Hair Therapy is a non-surgical therapeutic laser. It is the most powerful laser that is safe for cosmetic purposes. It fully complies with the European standard EN60825, for laser safety and have been evaluated by UL, CSA, IMQ, TUV, NEMCO, International Laser Research Group Association, and the National Institute of Radiation. The FDA states that the laser complies with the USA FDA CDRH safety regulations Section 21 for cosmetic use in the United States as a Certified Class 11A cosmetic laser. The hair laser has many years of research behind it, both experimental and clinical. ‘Cold-beam’ laser technology of the type in this Laser has been used internationally in salons and hair clinics for many years, in a broad range of hair care and skin care applications. The laser produces light measured at a wavelength of 632.8 nanometers, a pure wave length at the peak of red light in the visible light spectrum. The power level of the laser is so low that it is virtually a mere vibration, harmless but effective. One should not stare at the laser light source directly, to do so, one would have to intentionally stare upward. Can I use it with transplants? A: Yes. In fact, it is used post operatively to promote healing, reduce scarring, and ensure a higher rate of success for transplanted units. It has been proven very helpful when used before and after transplant procedures to help establish new grafts and minimize shedding of transplanted hair. Treatment should cease two weeks prior to surgery and resume two weeks after surgery. A: Yes. Laser therapy in conjunction with nutrient and topical therapy, may achieve faster and better results, than these treatments alone. If started early enough, it alone may be all the treatment that is needed to maintain your hair. Photo bio-stimulation: is the biochemical, non-thermal effect from the use of laser that results from the exposure of living tissue to various dosage of energy at varying wavelengths emitted from low level lasers.